Ellen Rydelius was the creator of the modern Swedish guidebook, but was also an eminent journalist and translator. Ellen Rydelius was born into a wholesale merchant family in Norrköping and grew up as a spoiled only child. The lack of siblings was apparently one of the reasons that she was able to continue her education, which at that time was not the norm for girls from the lower middle class. At the age of 18 she graduated as a private student and enrolled in Östgöta Nation at Uppsala University later that autumn. She appears to have had an exceedingly happy time as a student – she enjoyed a vibrant social life as part of the Uppsala women’s student association as well as in mixed companies, to the extent that her studies seem to have taken second place to more pressing worldly duties. Inspired by the writings of Ellen Key she also began living with a male student in something resembling a settled partnership. After gaining her degree in modern languages in 1907 Ellen Rydelius was determined to continue her studies, but first she wangled a study-trip abroad – also an unusual occurrence – to the faraway Kazan. However, her trip ended prematurely. Her father’s business was going badly and caused him to commit suicide. Thus, instead of gaining a licentiate degree, Ellen Rydelius was forced to seek employment. She approached the newspapers as they were in need of people with Russian language skills. She soon switched to journalism, becoming one of the earliest women to do so. Elin Wägner’s Pennskaftet has provided us with an impression of female journalists’ lives, but her novel was only published in 1911, a full three years after Ellen Rydelius had entered the newspaper world. During her period as a journalist Ellen Rydelius met Harald Wägner, brother of the aforementioned Elin. They married just five months after they met, and a few years later their daughter Maria – usually called Ria – was born. The marriage was not to last, however. Ellen Rydelius discovered that her husband was being unfaithful and so she left him. Ellen Rydelius had left her job at Dagens Nyheter when her daughter was born and had instead taken up freelance work. She began to do literary translations. Initially she focused on the Russian classics, and she spent the period of the First World War translating Dostoyevsky’s The Karamazov Brothers into Swedish. She also began a lifelong relationship with Bonnier’s publishing company and sometimes managed to negotiate a monthly salary for her translation work. Ellen Rydelius provides a typical example of a career author. As a single mother she was forced to accept various jobs in order to provide for herself and her daughter. Her correspondence with Bonniers not only reveals her ingenuity but also her poor housekeeping skills. She often earned good money, but her finances were strained by a hefty life insurance, which she had signed when she became single. Ellen Rydelius translated everything from works by Nobel Prize winners to thrillers, and as a journalist she sold articles on any subject that brought in a pay check – even on divorce. She had great support from her friends in the unofficial women’s network known as “Ligan” (the league), which provided mutual support both on a career and a personal level. One day toward the end of 1923, Ellen Rydelius became tired of her life in Stockholm. She took her daughter and her typewriter with her and moved to Rome. Although she continued her translation work and her journalism, the move to Rome led to a new career. According to Ellen Rydelius two of her visiting friends urged her to write a guidebook to the city. 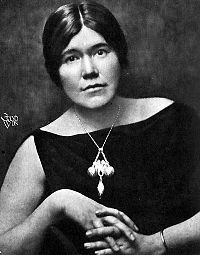 Upon her return to Sweden in the summer of 1925 she presented Bonniers with a guide to Rome, and the following autumn she wrote the first modern Swedish guidebook to Rom. Rom på 8 dagar can be seen as the first ever modern Swedish guidebook. It is brief but still quite comprehensive, divided into a section for each day of the week (Monday to Monday). The book also has an index and practical information about food, the opening hours of museums, useful addresses and religious and local celebrations. What was groundbreaking was Ellen Rydelius’ focus on the person as a whole – her readers are presumed to be interested in the whole life of the city not just its tourist attractions. Their requirements for rest, food and drink also need to be catered for. Breaks, lunch, tea and dinner are integral to the planned visit. She expressly distanced herself from the guidebook ideal of the day, Baedeker, where extensiveness was of greatest importance. The guidebook was possibly not only inspired by her visiting friends. Several foreign guidebooks probably influenced Ellen Rydelius, although her book is a complete original. Her success was largely due to her own narrative voice, which reminds of a local friend showing you around the city. From the first few pages Ellen Rydelius uses “we”, which she only leaves for taking on a role of authority. One reviewer described it as though she was personally taking the reader by the arm. This is in marked difference to the Baedeker tradition, which relied on an anonymous narrator. While Baedeker wanted to protect the visitor from the local population, Ellen Rydelius tried instead to awaken interest in them. Even historical events were tied to real people, possibly due to her journalistic habit of engaging her readers. Rom på 8 dagar was published in March 1927 and just a few months later Bonniers tasked its author with writing a similar book on Paris. For the next few years, guidebooks to Paris, 1928, Berlin, 1929, Italy, 1929, and Stockholm, 1930, – each with the number “8” in the title – were released. During the inter-war years another twelve “8s” were published, along with Lund på 12 timmar in 1937. Many of these were later re-issued as revised editions – the book on Rome was the most successful and was produced in nine editions between 1927 and 1957, while a tenth was posthumously revised in 1963. Paris på 8 dagar was also released in several editions. This was a new and unexpected career path for Ellen Rydelius. She became known as the “Swedish Baedeker” and was suddenly a great expert on foreign lands. She appeared as such on the radio, wrote articles and gave comprehensive lecture tours. She described herself as “a commercial traveller of cities”. Further, she undertook many trips abroad in order to prepare new books and to revise old ones. To Swedes her guidebooks were long viewed as role models of what a guidebook should be. During the Second World War it was difficult to travel abroad and Ellen Rydelius therefore focused on Swedish destinations and on cookbooks with French, Italian or Russian themes. After the war she revised the guidebooks, sometimes with the help of her daughter, who had frequently accompanied her on her travels and had helped from the early days with things like the indexes. The guidebooks of the 50s were of a slightly larger format with more modern covers and new titles – they were now called Med Ellen Rydelius i Rom, Med Ellen Rydelius i Paris, etc. However, the original title was retained as a subtitle. The last edition of the Rome guidebook was released shortly before Ellen Rydelius died, and the following year two books on Italy were published posthumously. Her translations continued to be published until the 1980s. Ellen Rydelius died in 1957. She is buried at the Skogs cemetery in Stockholm. Ellen Victoria Rydelius, www.skbl.se/sv/artikel/EllenRydelius, Svenskt kvinnobiografiskt lexikon (article by Carina Burman), retrieved 2019-04-25.